Can you imagine having every book in your library in matching bindings that were especially designed for you? No half-hearted half calf, either: full leather bindings with a signature design that instantly marks it as your property, even almost 500 years later. Such was the luxury enjoyed by the two Renaissance men described in today's post. Giovanni Battista Grimaldi (ca. 1524- ca. 1612), heir to a large Genoese fortune. While visiting Rome as a teenager in 1543, Grimaldi met the humanist scholar Claudio Tolomei, founder of the Accademia della Virtù. At Grimaldi's request, Tolomei undertook to help the young man assemble a "complete" library to advance his education. 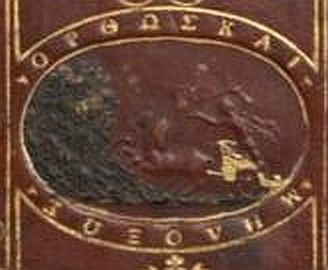 According to bindings scholar Anthony Hobson, who definitively identified the owner of the Apollo and Pegasus bindings, Tolomei agreed and "invented a device or 'impresa' for him" that depicted "Apollo driving the chariot of the sun, 'straight and not crooked,'" as the Greek motto informs us, towards Mount Parnassus, on whose summit Pegasus is standing. Apollo represented Grimaldi, who should aspire, like the god, to be a patron of arts and literature, while the straightforward course of the chariot symbolized the course of study Tolomei would devise for the young man, designed to lead him to the virtue and fame embodied in the winged Pegasus. Tolomei was an ardent advocate for treating modern languages as the equal of Greek and Latin in works of scholarship, and he included works in the vernacular in the Grimaldi library. These, like our volume, were bound in red morocco, while those in classical languages were bound in green or brown. Three Roman binders were engaged to do the work: Maestro Luigi, Marcantonio Guillery, and Niccolo Franzese. These men were also booksellers, and each likely bound the volumes that had been purchased from him. 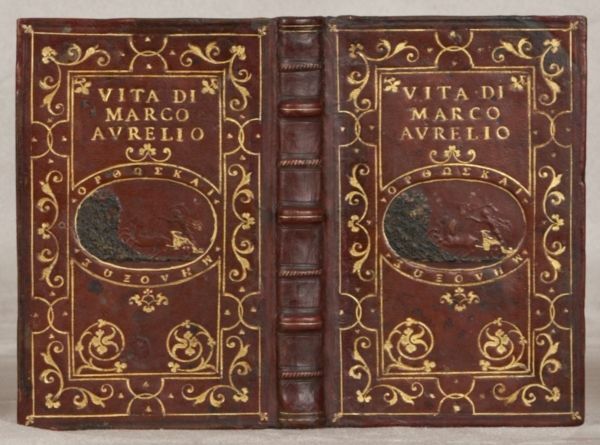 Apollo and Pegasus bindings are uncommonly seen: only about 150 volumes of Grimaldi's 200-volume library survive. Consequently, they command extravagant prices when they do appear in the marketplace: a "restored" octavo Seneca, also by Guillery, sold for more than $106,000 at Christie's in 2004. A scarce and highly desirable that can be sold for large sums of money will always attract the unscrupulous who try to pass off copies as the real thing. Just ask art collectors, museum curators, or fashion designers. Apollo and Pegasus bindings are no exception. 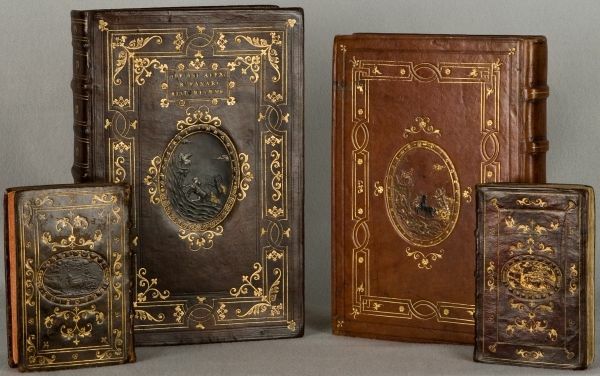 At least two binders are known to have faked Apollo and Pegasus bindings during the final part of the 19th and the first quarter of the 20th centuries. 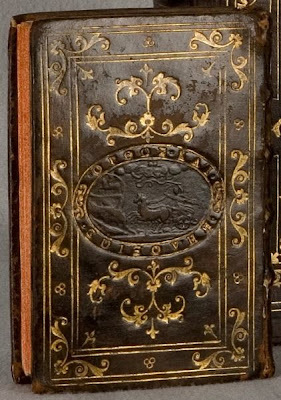 The first of these binders was Vittorio Villa (d. 1892) of Bologna and Milan, who typically started with plain or sparsely decorated 16th century bindings, which he then tooled more elaborately and to which he added the Apollo and Pegasus medallion. His work, which is strongly reminiscent of Guillery's, is almost certainly seen in the Homer volume described in the next entry. 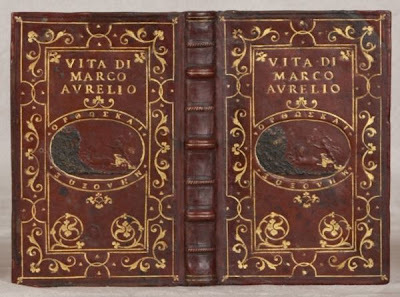 After Villa's death, his tools came into the possession of Domenico Conti-Borbone, a Milanese binder. These extremely convincing forgeries are sought by some collectors, not as replacements for the real thing, but because they are desirable curiosities and, as binding specimens, are fine pieces of work done for early books with inherent value. 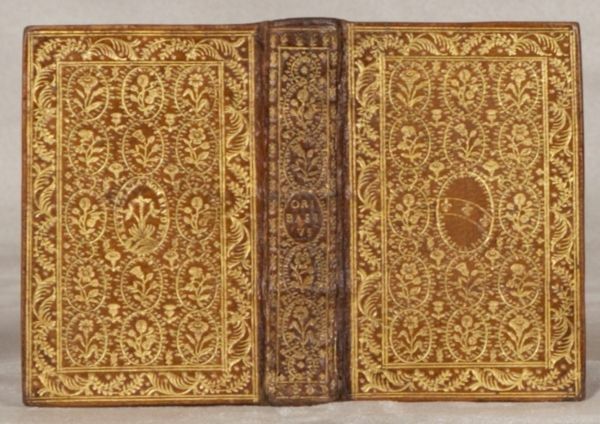 Venetian diplomat Pietro Duodo (1554-1611) served as ambassador to the court of French king Henry IV from 1594 to 1597, and took advantage of his residency in Paris to accumulate a portable gentleman's library of 90 works in 133 small but dazzling volumes. 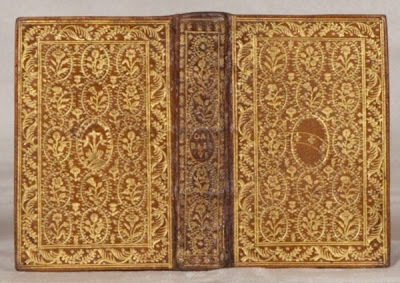 He commissioned a Parisian atelier to produce richly decorated, color-coded bindings for the works: olive brown morocco for literature (72 volumes); red for theology, philosophy, and history (46 volumes); and--rarest by far--citron for medicine and botany (15 volumes). Duodo never had the chance to enjoy his library: he was recalled to Venice and later served as its ambassador to Prague, London, and the Vatican. His portable humanist library remained in Paris, probably packed away, for 200 years. Volumes began to appear on the market around the time of the French Revolution, and have been sought after by collectors ever since. 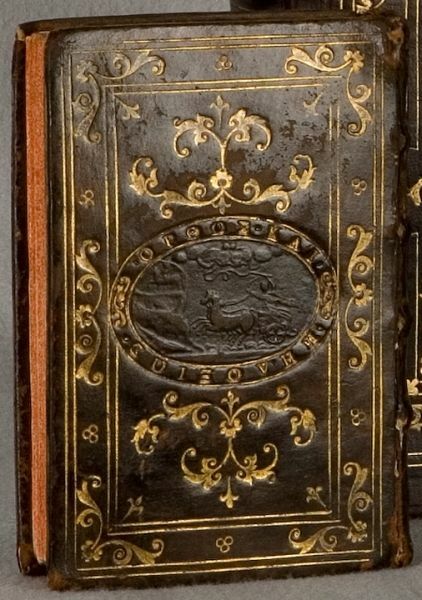 The binding's provenance can be established by the very distinctive stamps used on the Duodo bindings, as well as unusual features like the raised "à la grecque" head and tail of the spine, seen here and on other Duodo bindings in the British Library's Database of Bookbindings.